The stories that hit the news are often the big multi-million dollar cases against the large corporations of America. The class action lawsuits. The nationwide danger of a popular product or drug. In reality, the majority of people looking for legal representation are seeking help with a local matter. And whilst that big New York law firm may be dying to take on your MacDonald's permanent disability accident case, they may not be so willing to help you out over a dispute with your local dry cleaner. 1to1Legal.com is a search function that lets you know exactly who your local lawyers are. They are the firms that will know the local services, the local perceptions, the local area, the local history, the local news and the local law personnel. 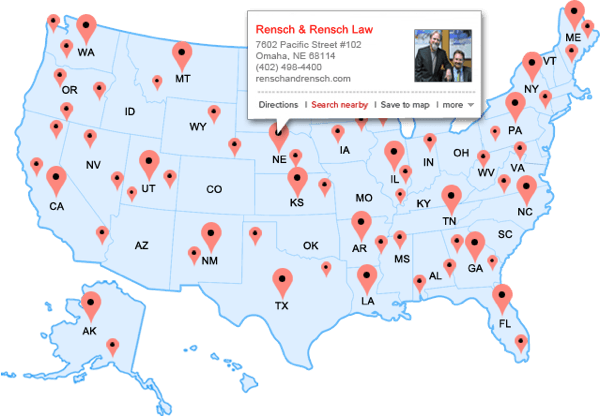 It will also save you time by only showing you the law firms nearby that deal with your type of case. That will erase the need for those first ten phone calls resulting in "sorry, we don't deal with that". Just over a decade ago, we all knew the playing field. A Yellow Pages ad, business cards, and maybe a TV ad if you had the budget. Most of the time, you got clients through word-of-mouth. Of course, these days 'word-of-mouth' has become 'tap-of-the-fingers'. Also, with Local Search and Social Media increasingly surpassing the simple SEO needs of any online law firm marketing plan - it's nice to know that at least one old-fashioned business strategy can still be relied upon .... 'outsourcing'!